Dehong Pu-erh Mini Beeng Cha is a convenient way to enjoy a cup of Pu-erh tea at home, at work or anywhere carrying large tea cakes might be difficult, we are happy to offer this smaller version of Pu-erh Beeng Cha. 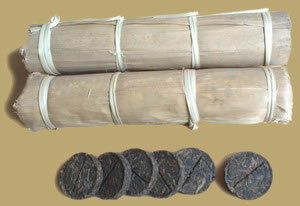 Twenty mini Pu-erh cakes, weighs about 10 grams each, wrapped in natural materials for aging or gift giving. PREPARATION: To prepare Mini Pu-erh Beeng Cha, break off half a mini cake and place in a teapot. Rinse by covering with boiling water and quickly pour off. Cover with boiling water again and let steep 5-30 seconds (depending on how light or dark you want the tea) and serve. Pu-erh tea can be steeped 10-20 times.